June 7, 2017 | 1:30 p.m.
Wisconsin's private sector job growth ranked 33rd in the country in 2016, according to detailed numbers released Wednesday by the federal Bureau of Labor Statistics. The state added private sector jobs at a rate of about 0.5 percent in 2016. By comparison, the national growth rate was 1.3 percent. 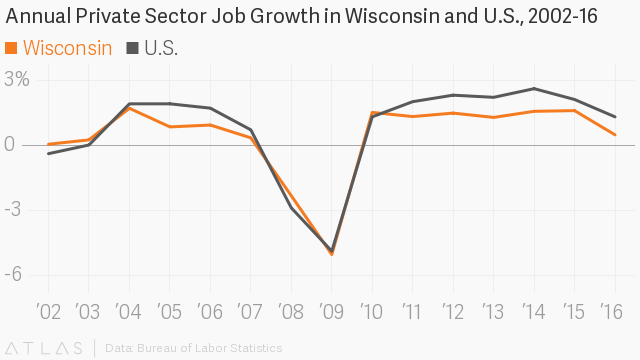 "What it means is Wisconsin, in terms of employment growth, is falling behind," said Louis Johnston, a professor of economics at the College of St. Benedict and St. John's University in Minnesota. 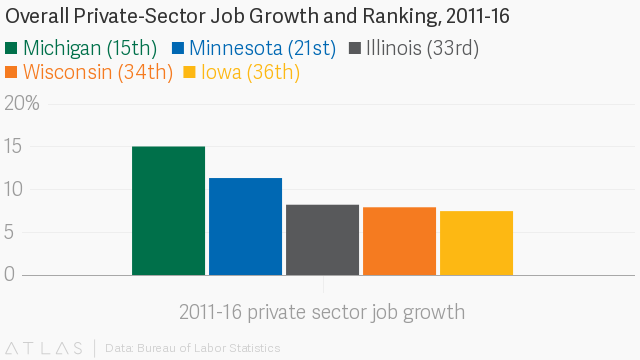 Among its Midwest neighbors, Wisconsin lagged far behind Michigan (1.5 percent) and Minnesota (1.3 percent) but grew faster than Illinois (0.4 percent) and Iowa (0.01 percent). The data released Wednesday also provided the most thorough picture yet of job creation since Gov. Scott Walker took office in 2011. Over the past six years, Wisconsin's private sector labor force grew by about 7.9 percent. That trailed the national rate of 13.2 percent from 2011 to 2016 and ranked 34th among all states. The last time Wisconsin added jobs faster than the nation as a whole was 2010, the first full year after the end of the Great Recession and the year before Walker took office. During his first campaign for governor, Walker promised to help the state create 250,000 jobs by the end of 2014. The new numbers show that Wisconsin has added 179,778 private sector jobs since Walker took office, which is still 70,222 jobs short of his first term goal. These numbers come from the Quarterly Census of Employment and Wages, which economists regard as the "gold standard" of job metrics. The QCEW is based on a hard count of reports from nearly all employers, which is why it's so accurate and takes so long to produce. 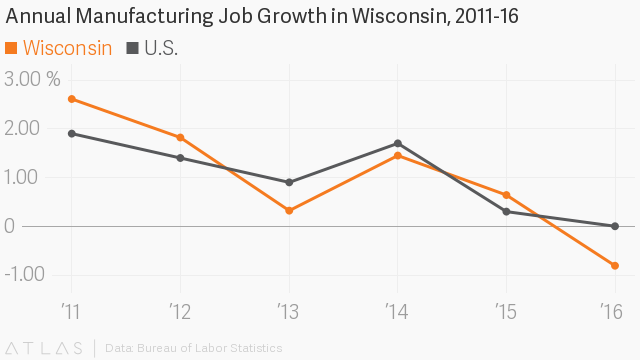 Wisconsin lost manufacturing jobs in 2016, but it was hardly alone in that regard. A total of 28 states lost manufacturing jobs in 2016. Nationally, the manufacturing workforce basically broke even. Because of that, Wisconsin ranked 30th in manufacturing jobs compared to other states even as it lost 3,784 manufacturing jobs in 2016. "Manufacturing right now is not a growth area for employment,"Johnston said. "It's more a matter of automation, of substituting capital for labor--that is putting machines in place and computers in place of human beings." The job losses came at a time when the state of Wisconsin was spending nearly $300 million per year on a new tax credit for manufacturers. Average weekly wages for private sector jobs also fell in Wisconsin and the nation in 2016, which is unusual at a time when the unemployment rate is historically low. The average weekly wage for private sector jobs dropped by 1.7 percent nationally. 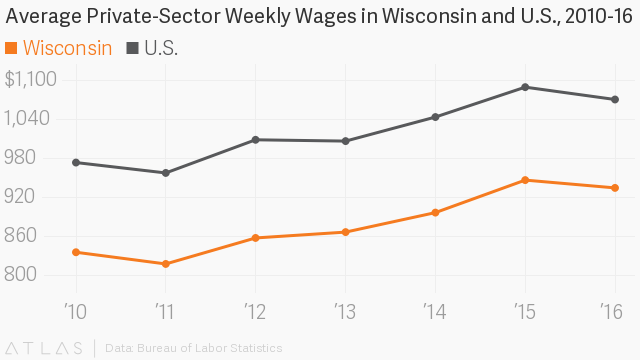 In Wisconsin, wages fell for those same workers by about 1.3 percent. "That's a pretty big drop when you're thinking about the average standard of living of a household," Johnston said. 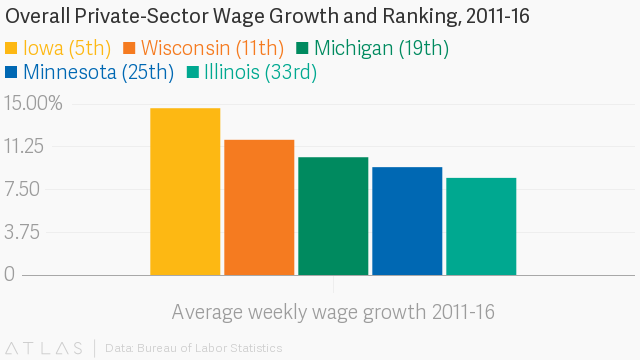 Wages also fell in Illinois (2.2 percent), Michigan (1.8 percent), Iowa (1.1 percent) and Minnesota (0.8 percent). When looking back six years, the picture improves for Wisconsin. From 2011 to 2016, the average weekly wage of private sector workers grew by 11.9 percent, which outpaced the national rate of 10 percent and ranked 11th in the nation. Editor's note: This story was updated with additional reporting about manufacturing job numbers and weekly wage rates.